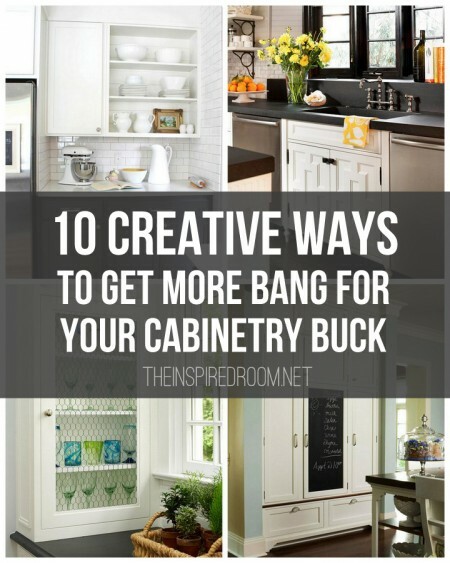 Want more bang for your cabinetry buck? You can embellish any cabinet door with molding, glue and paint! 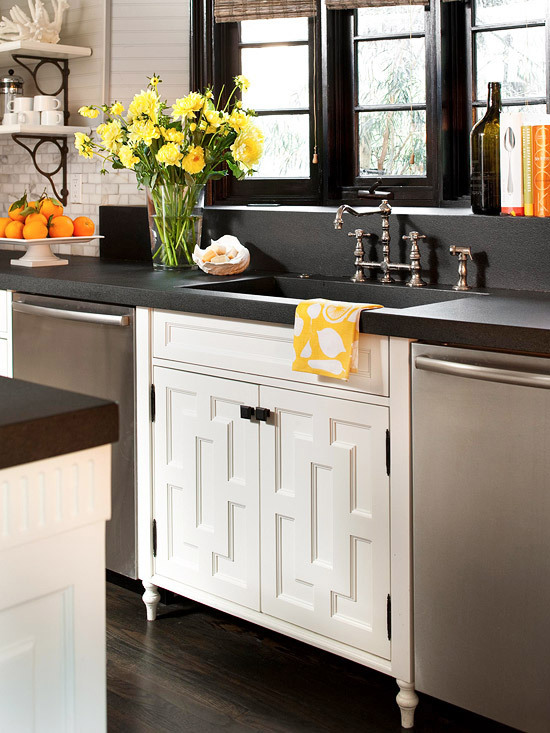 Look how awesome those cabinet doors from BH&G (above) look with the unique molding design. My little powder room had a faux wood vanity that just wasn’t the look I was going for. While I wanted to rip it out and start over, I was able to prolong its life with a simple coat of primer and paint. Instantly better! In our old kitchen, we wanted something very old world and unique for our stove cabinet. So, we went to a garden center and picked out real bamboo pieces, had them cut and burned, and glued to the cabinet. 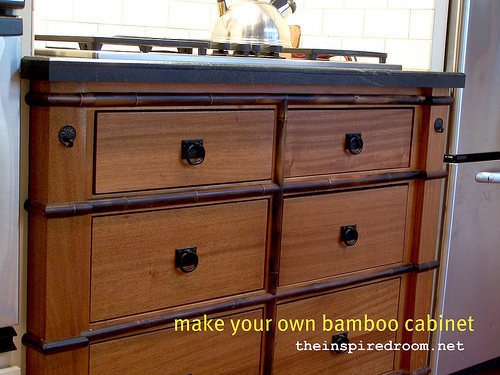 The bamboo gave it a much more custom creative look than standard stock cabinetry, without the expensive price tag. We went with a mahogany finish to fit in with our tudor style house and contrast with our white cabinetry, but you certainly could paint it any color that works with your decor. Put your own spin on your existing cabinet doors. 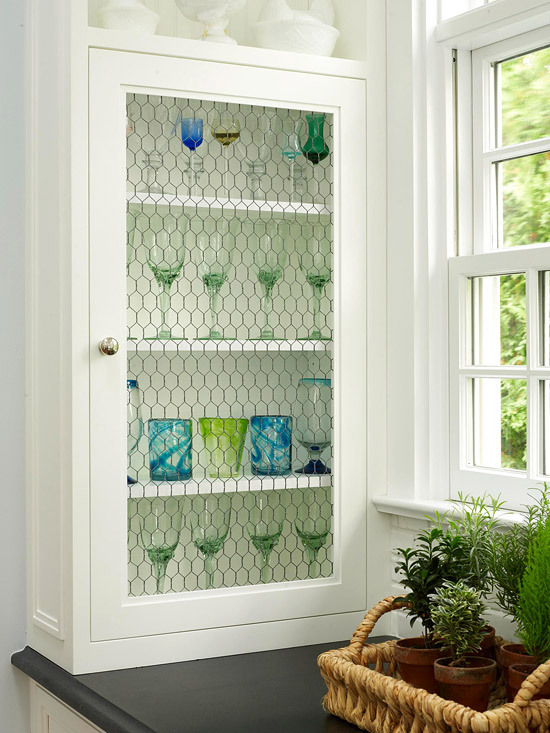 Chicken wire, leaded glass, ribbed glass, fabric…there are so many ways to take an average cabinet door and give it your own flair and personality. 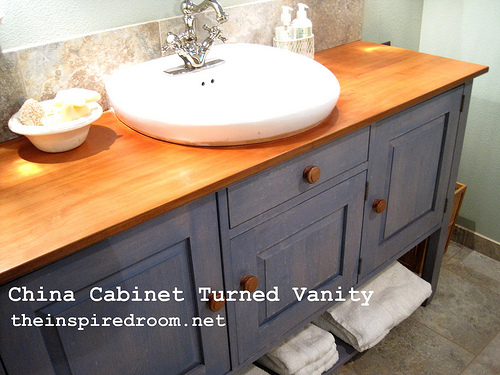 Who says you have to have a run of the mill vanity cabinet? If you can store all your ugly toiletries elsewhere, go for the open shelf instead and make your bathroom look like a spa. That is what my mom did in our beach house with this simple butcher block counter and an open lower shelf. 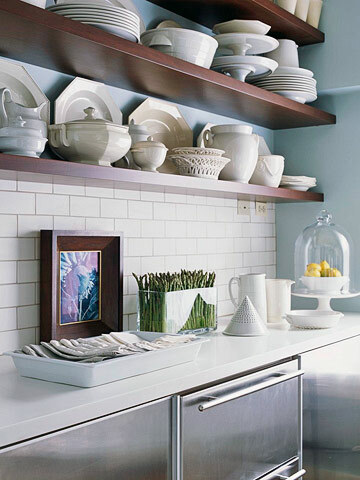 Just because you have a china cabinet with a hutch doesn’t necessarily mean you have to keep them together. They will forgive you for separating them from their mate. The lower cabinet became the bathroom vanity (above) and the upper hutch part of this china cabinet became storage for the laundry area, fitting perfectly above the washer and dryer. Two solutions with one cabinet! I love this chalkboard painted right on a cabinet! Added personality plus function, all with a can of paint. Maybe that is all you need to refresh a tired cabinet? 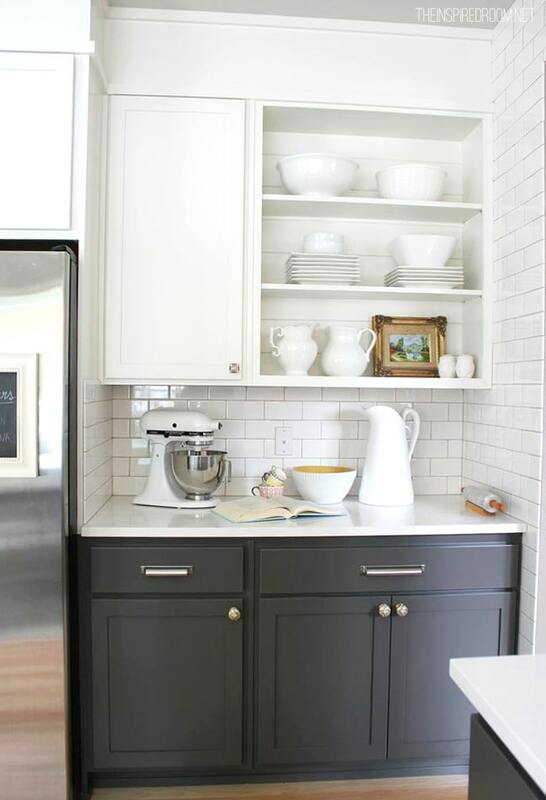 Just because your cabinets are UGLY doesn’t mean you have to rip ’em out. Our built in china cabinet in our old house underwent a facelift and we refurbished what we had. Amazing what glass doors, v-groove paneling on the sides, new counters and drawers and a few other details can do to transform a hum-drum piece of cabinetry! You would never guess it was the same cabinet. You all know I love open shelves (update, you can see our kitchen remodel here!). Don’t tell me you can’t have open shelves because they wouldn’t look this nice. That is silly talk. You can choose to put cute things on open shelves, you don’t have to throw your Cheerios boxes and plastic bowls there. Use your closed drawers and cabinets for uglies! 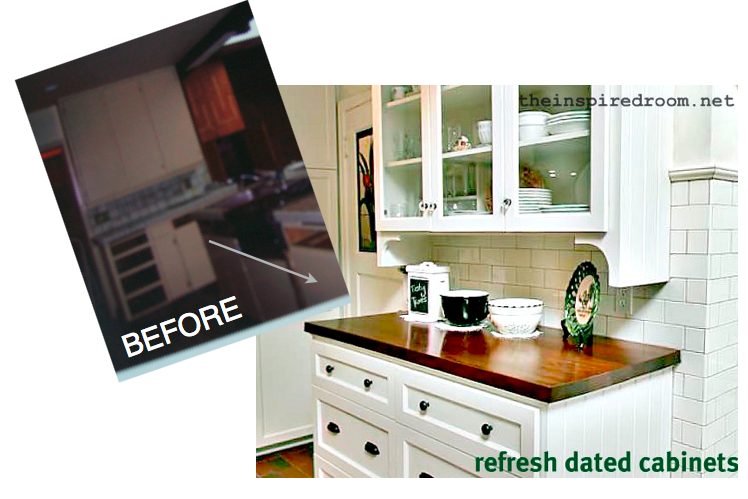 By taking cabinets down or even just removing the doors of existing cabinets can totally transform a room and give it an entirely new look! So, go forth and embellish, repurpose or reinvent! Boy reading this post makes me want to repaint my entire kitchen. It is not that old but the stain looks so tired…Paint really changes the look of a room. I need to have my hubby read your post. Maybe I can get him to see my point…it’s time to PAINT! My good friend has an old victorian in Napa, CA that has copper chicken wire cabinets in the kitchen – I’ve always been an admirer…..
Melissa, You have tons of great ideas here. I’ve painted my kitchen cabinets many times. It’s amazing what a difference a fresh coat of paint can do. But I haven’t tried gluing on embellishments. That might be my next project. Thanks for the wonderful tips. You inspired me to paint my bathroom vanity and it turned out beautifully. In fact, it’s one of my most popular posts to date. Here is the finished cabinet in the post below. Love the ideas. I’m currently thinking about painting some bookcases. I painted them black about a month ago and they are beautiful in black. But, I’m seriously thinking of painting them a soft white color (the same as my kitchen cabs). I just have not bitten the bullet yet. I’d love to know what you think. My walls are crimson red and the kitchen, dining, and living rooms are all open to one another. My kitchen cabs are painted swiss coffee. It’s a soft,creamy white. Thanks for any thoughts on the matter. I’m sure your bookcases are beautiful in black. I’m sure if you changed them to a soft white they would be just as beautiful and perhaps you’d feel they would flow better with your other cabinets? Not sure where the bookcases are but if you rooms open to one another it might be soothing to the eye to have all the cabinets a soft color! When we renovated our old home there was so much we had to do, that we didn’t have much money left for decorating. Your ideas are great. I know I used a lot of them to make the existing furniture we had look good in the new space we had created. Paint can make so much of a difference, especially when you add the mouldings to them. I’ve used mouldings on my stairs as well. It looked beautiful. 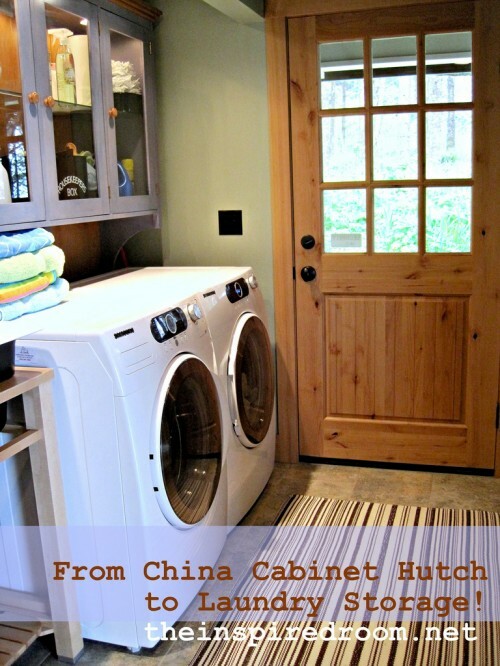 The hutch that you re-purposed for the laundry room and bathroom was genius! 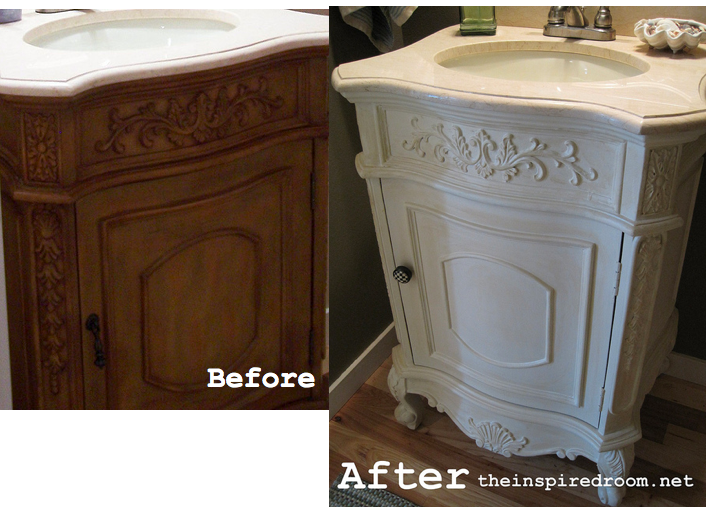 I have a antique dresser in my guest bath, with a drop in sink, which I did 16 years ago and I still love it! I can see why you miss your tudor and beach house, but you’re creating beauty in your ‘new’ home too. Your creativity is always inspiring. Hi Melissa, By sharing with us your Mom’s ideas and having taken a peek at your daughter’s blog, you are a very fortunate family having the gift of a very good eye, ingenuity and wonderful taste. Btw…a beach house would be my dream come true. (Oh and it would have to come with a very clever interior designer..lol.) Have fun! Aw, thank you!! You are a dear! This is the first blog I have ever followed. Your ideas are fantastic! I just want you to know that I look forward to each post. Keep up the good work! Wow, thank you so much! Honored!! My kitchen cabinets aren’t that old, but I hate them–too dark for an already dark room. I see paint in their future, and maybe some chicken wire. Great ideas! 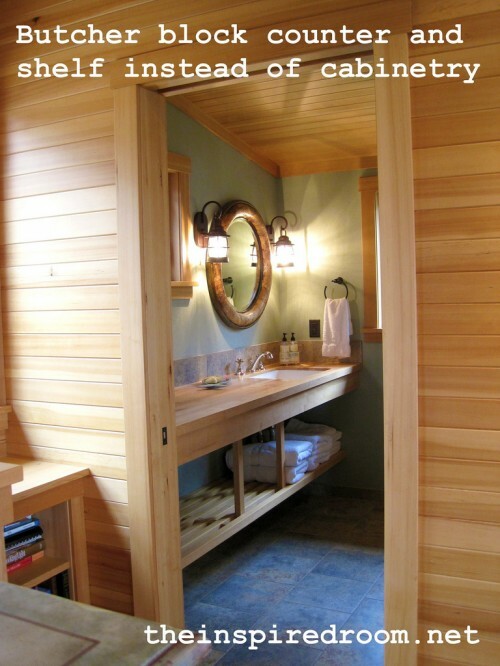 I love these, and you are like a genius with the hutch turned vanity and laundry storage, so clever! Hi Melissa, great post! I love what your mom did with that china cabinet! I live in an apartment so I was pretty limited with what I could do with my cabinets. I covered them with fabric and I love them! I feel they are so whimsical and fun now.